I’m not the biggest cheesecake fan. I know people go all crazy over it, but my drug of choice is chocolate of any sort and I have incredibly, stupidly sweet teeth. Like, I eat my piece of cake and then eat the icing that my Main Taste Tester scrapes off of his. I never think a dessert is too sweet or rich, and when other people do, I look at them like they have five heads. This week, my MTT’s mom and I co-hosted a little ladies get-together. Because she was taking care of the chocolate part of the menu, I decided to look for something fruity to make. Fact: if I’m going to make a fruity dessert, I’ll probably make something with strawberries. I love them. I found a bar recipe that had a sugar cookie mix layer, a white chocolate cream cheese layer and a fresh strawberry layer on top. Sold. I’m not a big fan of using mixes so I used my favorite cookie dough base and omitted the chocolate chips. 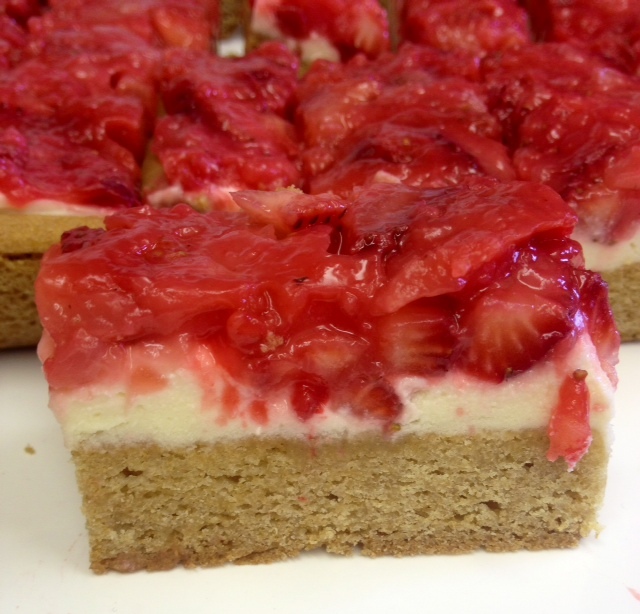 The cheesecake layer is just cream cheese and melted white chocolate whipped together and it gives a richness to the bright strawberry filling. I really, really enjoyed them despite the lack of chocolate. I made a huge batch so I sent half to my MTT’s work. He told me that several people sought him out to tell him how good they were. I’ve already been planning a chocolate version to make next, because I can’t leave anything alone. Chocolate addiction is real and I have no plans to quit. Preheat oven to 325 degrees. Line a 9×13 pan with parchment. Mix the flour and baking soda in a medium bowl and set aside. In another larger bowl, mix the butter and sugars until combined. Add the egg, egg yolk, and vanilla and stir until mixed. Gradually add flour mixture and mix until a dough forms. Press dough evenly into prepared pan. Bake for 20-25 minutes or until golden brown and still a little under baked in the middle. It will bake more after you take it out. Let cool before putting cheesecake layer on top. On the stove top or in the microwave, melt white chocolate chips, stirring until totally melted and smooth. Whip cream cheese with your mixer until light and fluffy, then stir in white chocolate, mixing until full combined. Spread evenly over cooled cookie layer, then refrigerate for about an hour or until firm. In a small bowl, crush 1 cup of the strawberries ( I used a potato masher). In a medium saucepan, mix the sugar and cornstarch together. Add the crushed strawberries, water and vanilla. Cook over medium heat, stirring constantly, until the mixture comes to a boil and thickens up. Add food color, if desired. Cool filling for 10 minutes, then stir in the remaining strawberries. Spoon topping over cheesecake filling and smooth it out evenly. Refrigerate at least 1 hour or until set and cut into bars. Store covered in the refrigerator.